Just like with the bacon, ham is made with the pink salt which has nitrates in it. I wanted to try it without the nitrates, and as the video I used says: it’s a really good roast pork leg, but it’s not ham. Next time I carve a pig, I will do one leg with the pink salt and one without. It is really good, but I want a ham too. 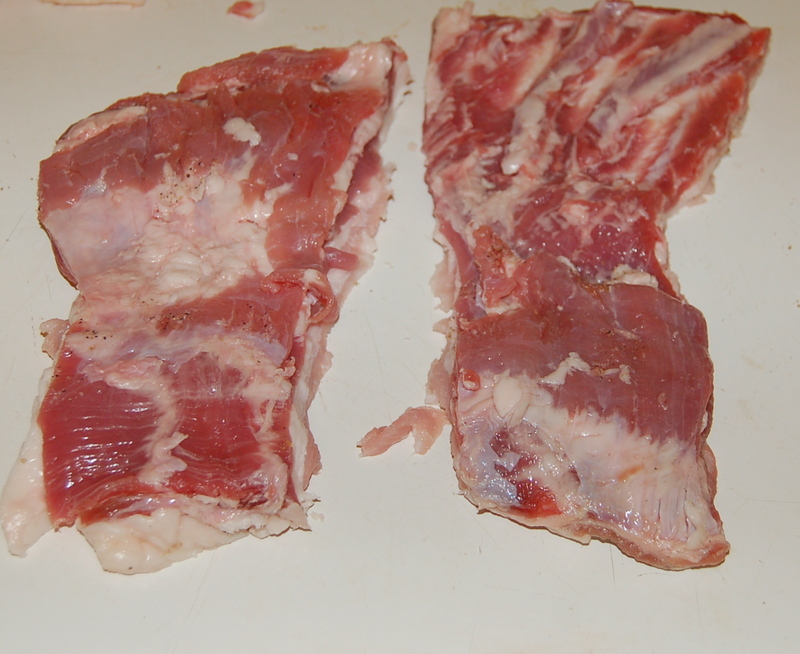 All I did was to brine the leg for 6 days in an ice filled cooler, then roast it as you would any raw pork leg. 350 degrees for 6 hours. It depends on the size of the ham or pork leg as to how long it cooks for and how long you brine it for, but I don’t know all the specifics. Here is a link to a video that I got some of my info from. Sorry that I don’t have a ton of info to share, but I kinda just dumped stuff together to make the brine. It was salt, brown sugar, and pickling spice. I boiled it all up, let it cool, and then put everything into the big brine bag. I will make it again and keep track of what I’m using. I also want to add that this wasn’t smoked, just like with the bacon, because I don’t have a smoker and wanted to try it out. We try to do everything as “natural” and simple as we possibly can. Therefore I like to try recipes that do not include ingredients that might be less than good for you. 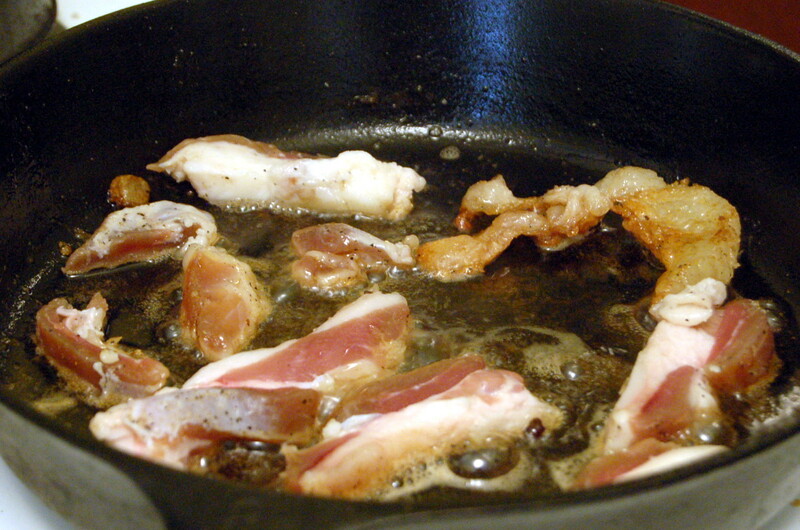 In this example here, I want to make “bacon” without nitrates. The pink curing salt normally used has nitrates in it. 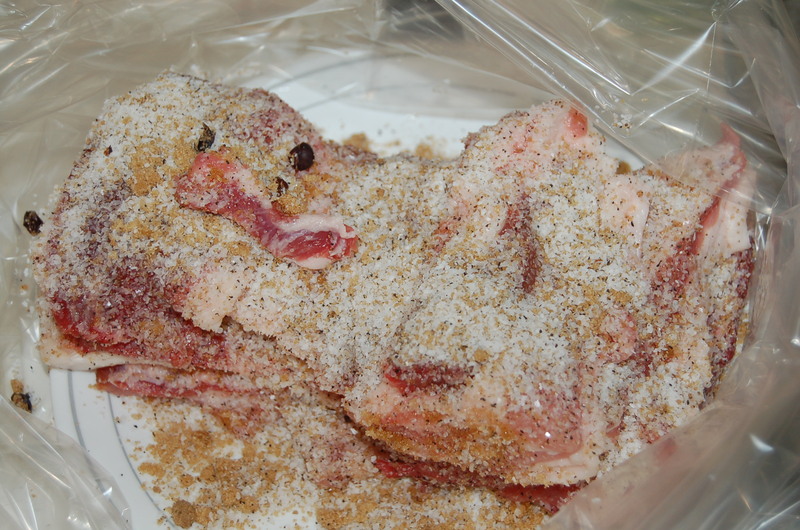 There are many recipes out there that do not use the pink curing salt, so I gave one a try. I wanted to taste the “bacon” in its simplest version to see if it was good without the pink stuff. I figured that if it was awful, next time we would use the pink stuff. We have got to at least try, right? Be sure to coat the top, bottom and sides in the rub. Then stack the pieces in a pile. I put mine in a big plastic bag on a plate because my pans are all still packed somewhere, but you should try to stack them in something like a corelle dish and just cover them with plastic. I am working on finding alternatives to plastic, but haven’t got there yet. Again, not pretty. Let them sit like this wrapped up in the fridge for 24 hours then rotate. Top to bottom, bottom to middle, middle to top. Return the stack to the fridge for another 24 hours and repeat the rotation. Repeat once more for a total of 3 days in the fridge. After the 3 days, take the bacon out and rinse very well. I found our bacon to be too salty, and so next time we have a chance to cook bacon, we will blanch it for 2 minutes before frying it up. Blanching pulls out the excess salt. At this point, you could smoke the bacon. We don’t have a smoker and I wanted the simplest form of bacon, so we just skipped the smoking part. Now we cut it, fry it, and eat it! So this is pretty much the same post as the couple before it, just with ground beef. I found this excellent website, Poverty Prepping, to help me with this project. 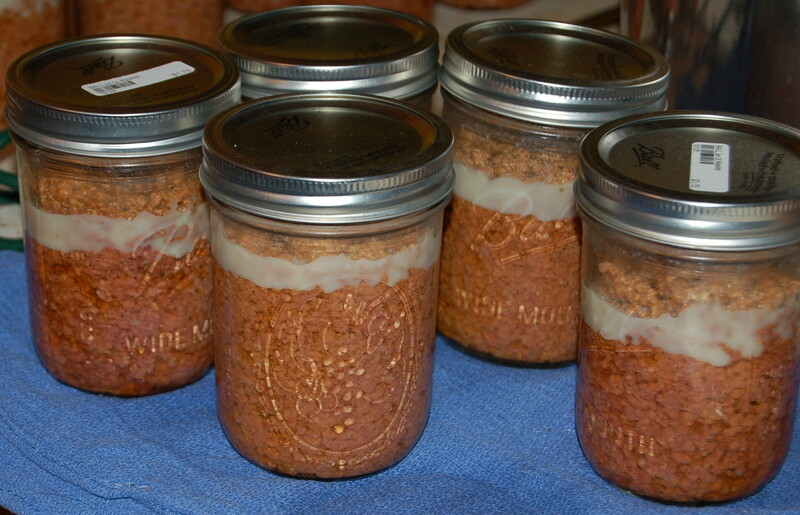 This site uses a method called dry canning to can ground beef in all it’s forms. 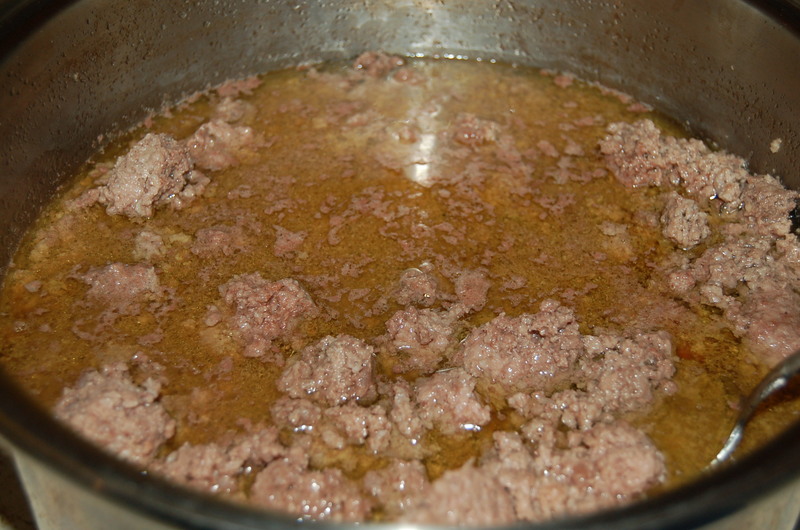 You can can pre made patties or meatballs as they are, just without liquid to help them keep their form and taste. 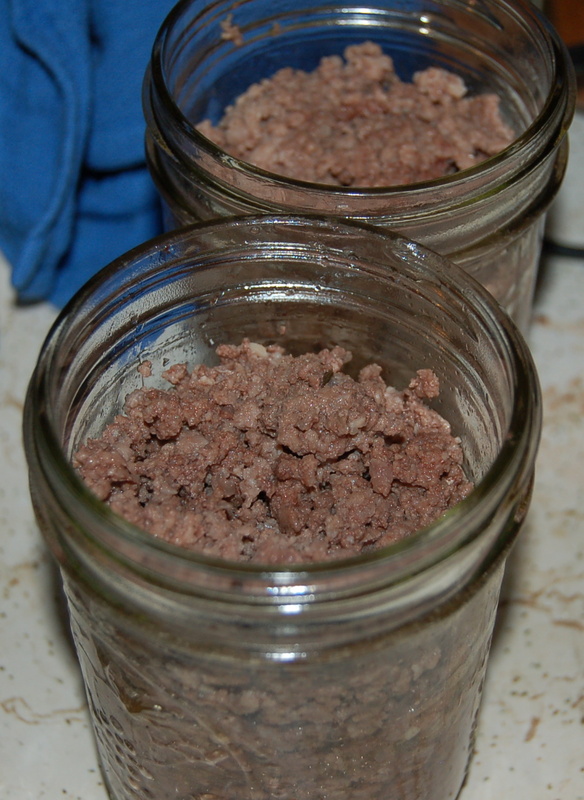 I didn’t have time to be fancy, so I just canned pre cooked ground beef. I just boiled it until it was just brown. 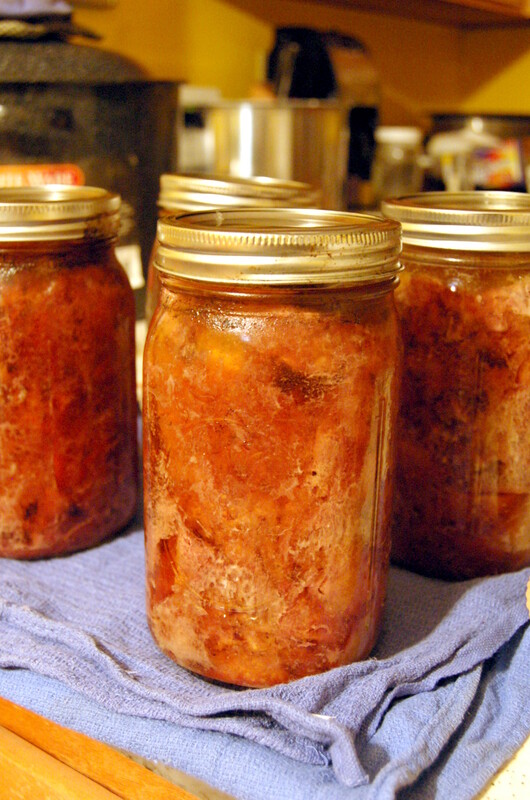 I prepared everything else as done in all the other canning projects. I sterilized the jars and heated the lids in close to boiling water. I filled the pint jars to just below the threads with the hot ground beef, not draining it completely, but not adding any extra juices either. 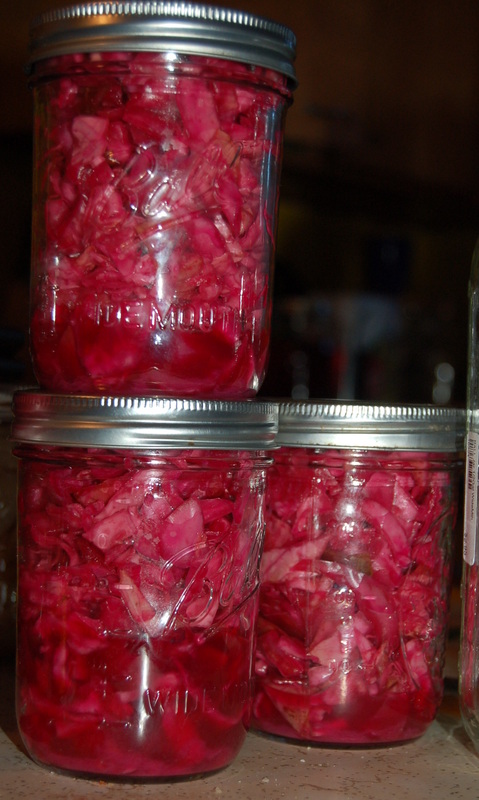 I then processed the jars for 90 minutes at 10lbs. The reason I really liked the website I listed above was all the details it gave. It listed what pressures at times for all kinds of meats including beef, venison, chicken, pork etc. There was a lot of good information from people who seemed like they had a lot of experience in the area. 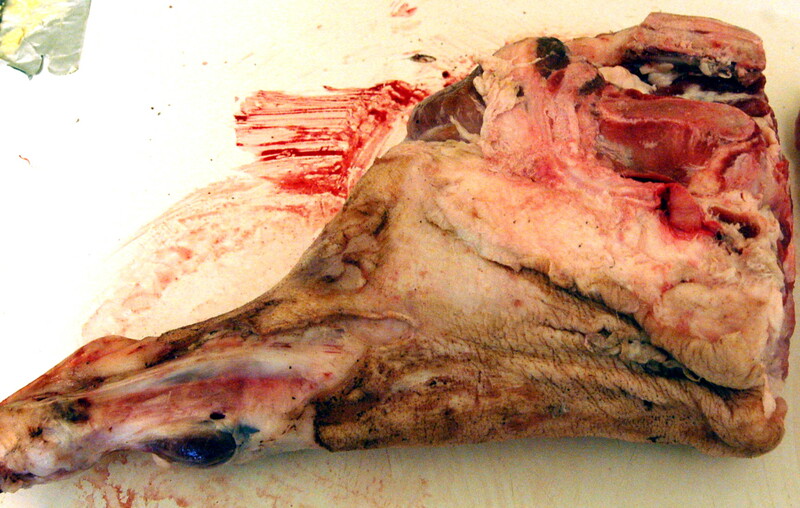 I encourage anyone who wants to get into canning meat to check out the site. My project was a success, and I didn’t overfill or break any cans this time. Now all the extra meat we have is canned up and ready to go. I’m still working on getting everything canned before the big move to the homestead. 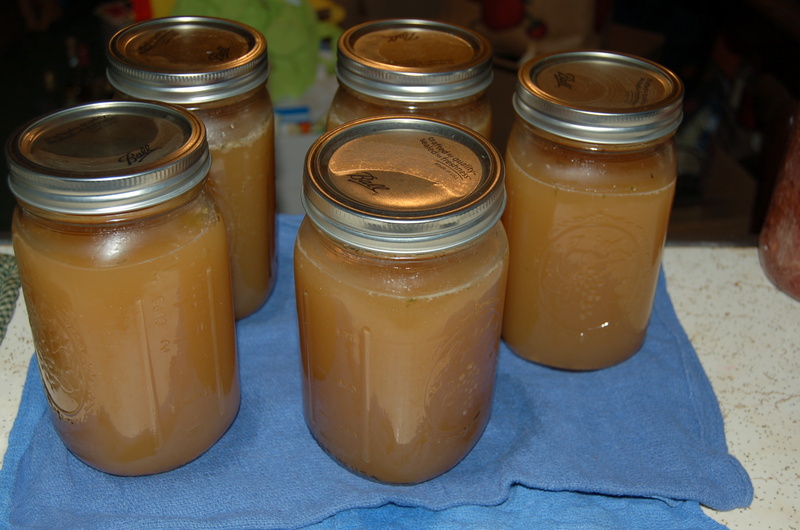 Today’s project: Canning beef broth, which the Man made for me the other day. We have an excess of soup bones in the freezer and will no longer a freezer once we get to the new homestead so it had to be done. 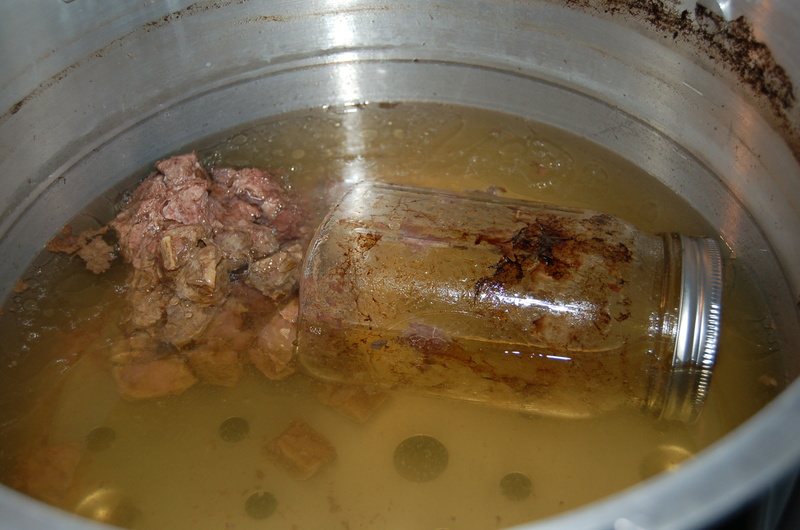 This vat of broth in the picture was full before I started my meat canning project. It really is wonderful stuff, I’ll share more later. This is my first time doing this, so here is the website I got my information from: Recipes We Love. It was actually a really simple project. 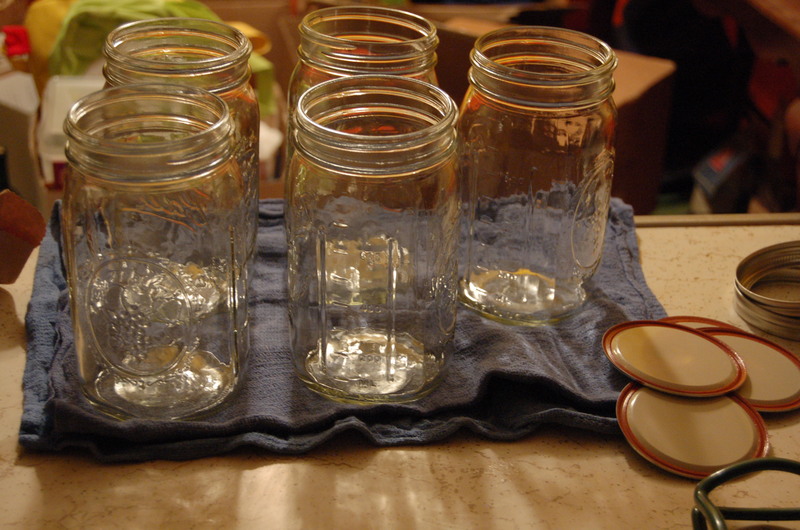 I sterilized my jars and heated my lids just like I had done before and just like you should do whenever you can (as far as I have seen so far). 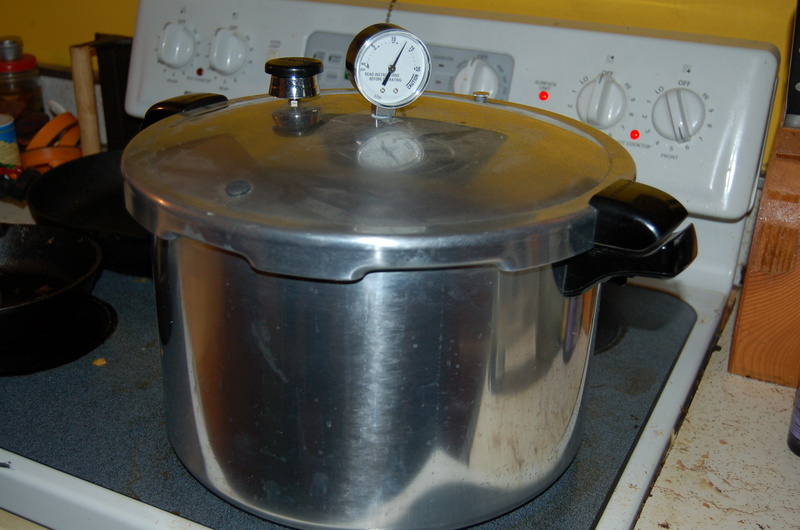 At the same time, I heated up the broth so that it was a similar temperature as the jars to prevent breakage. Then I filled the jars using a funnel. 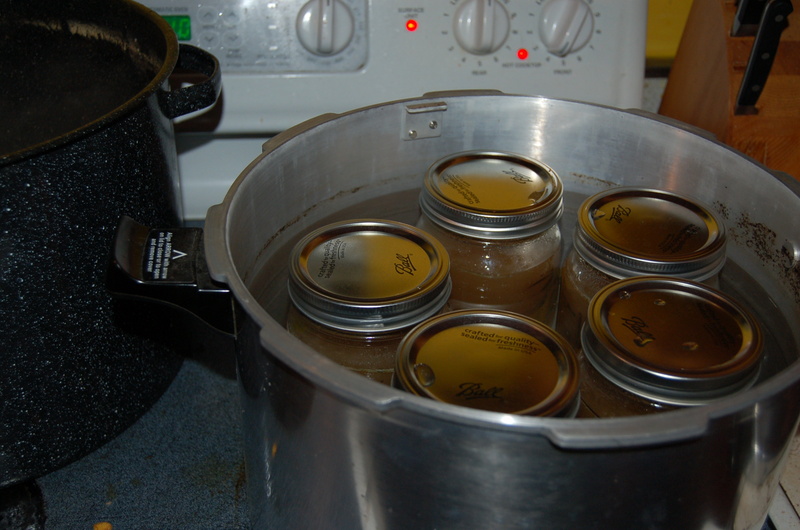 Once they were all full, I wiped them down, put the warm lids on, screwed on the rings and put them into the pressure canner with the water to the fill line. I processed them at 10lbs for 25 minutes. These were quart jars, but pints only need 20 minutes. After the pressure dropped to 0, I opened it up and pulled them out. No broken jars today! They all popped almost right away. Done!